Turkey has become one of the most popular holiday resorts for booking a villa holiday and there’s little surprise as to why. With its turquoise coast, mountain views and ancient ruins, there’s plenty to see and more than enough to do too. Better still, you’ll find a wide selection of villas and apartments with everything you might want for a perfect family holiday. But just because there’s a great range of quality holiday villas in Turkey, it doesn’t mean you have to break the bank, so to lend a helping hand, we’ve picked some cheap holiday villas for you that all come with summer 2019 availability. This beautiful villa is not only cheap but also incredibly well located. You have two beaches close by, bars and restaurants, and the Dalaman Havaliman airport just 25km away too. As for the villa itself, it’s a wonderful air-conditioned property that comes with a beautiful private pool and is close to both the waterfront and mountains. The price? Just £1,390 for one week in August 2019. This amazing apartment in Manavgat is a real steal. Not only is there a lovely pool, but you’re also close to a wide range of amenities and the beach is only a few minutes away too! There are also lots of natural wonders to marvel at close by like waterfalls and mountain views, whilst elsewhere there’s historical ruins and golfing facilities too, making for a perfect holiday for all the family. All this for a mere £440 for one week in August 2019. This lovely villa in Fethiye is the perfect place for a great family holiday. Not only is it near the beach with some stunning mountain views, but it also has a pool and great amenities close by. Air-conditioned with large bright rooms, it can also boast a private garden and a lovely terrace to relax in. This beauty will set you back a mere £620 for one week in August 2019. This incredible luxury villa is an amazing place to spend a holiday together for special occasions. 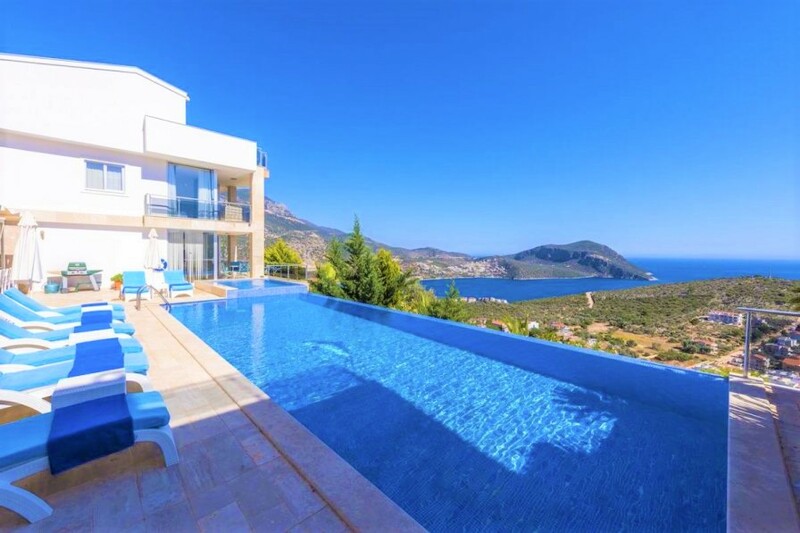 Situated in the wonderful Kalkan and with an astonishing infinity pool overlooking sea views, it’s the perfect place for a holiday in Turkey with a difference. Only a few minutes from the center where you’ll find bars and restaurants as well as various activities, it’s also home to a beautiful harbour and the opportunity for water sports. This stunning villa is £3,500 for one week in August 2019.